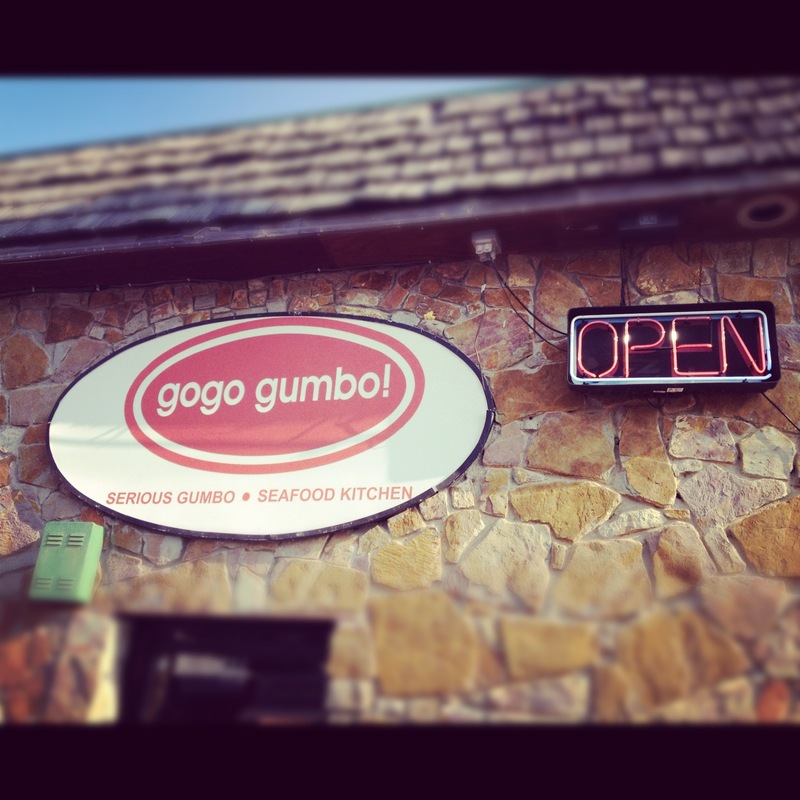 Gumbo in Texas – GoGo Gumbo! The story of GoGo Gumbo! is almost too good to be true. A talented and passionate chef opens a small restaurant in a small town in the middle of nowhere and puts out food so good that folks drive hundreds of miles to wait in line for a chance to fill one of the only fifty seats at the restaurant. That is exactly what chef and owner Kraig Thome did when he opened GoGo Gumbo! in Boyd, TX. Where is Boyd, TX? You’ll just have to Google it. As many of you know I am obsessed with gumbo and am constantly on a mission to find new places to get gumbo to satisfy my addiction. GoGo Gumbo! has been on my list since I saw them featured on NBCDFW. This Saturday I made the trip to Boyd with one thing on my mind: GUMBO. We arrived at 5pm and as expected the place was packed. There was a 45 minute wait, but it actually turned out to be a piece of cake. GoGo Gumbo! 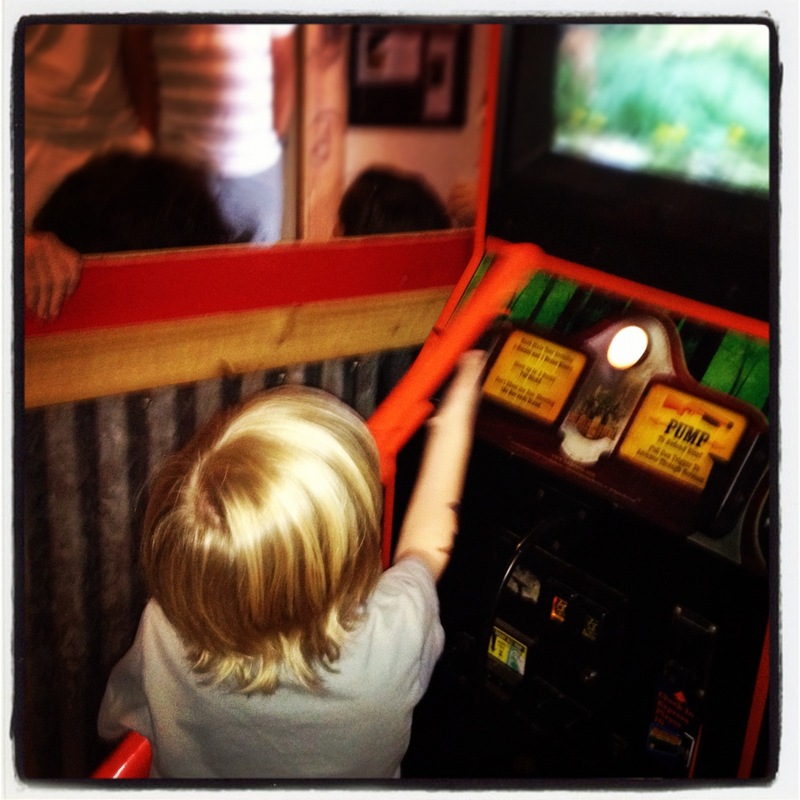 has video games with guns and this made my son happy. Once all the bad guys were dead my son sat down and colored for a while. GoGo Gumbo! has complimentary coloring books, colors and board games set out for the kids (and adults?). Most adults sat while they waited and drank wine from their own bottles. GoGo provides glasses, but the restaurant is BYOB because Boyd is in a dry County. This is actually a plus because bringing your own bottle is always cheaper than paying restaurant prices. Our buzzer went off and our table was ready. Now for the good stuff. Our server, Jeff, was great. He knew the menu backwards and forwards which he attributed to the fact that the chef cooks dinner for the staff every night after work. How cool is that? I immediately got down to business and ordered a cup of the shrimp and crab gumbo and the tempura green beans to start. 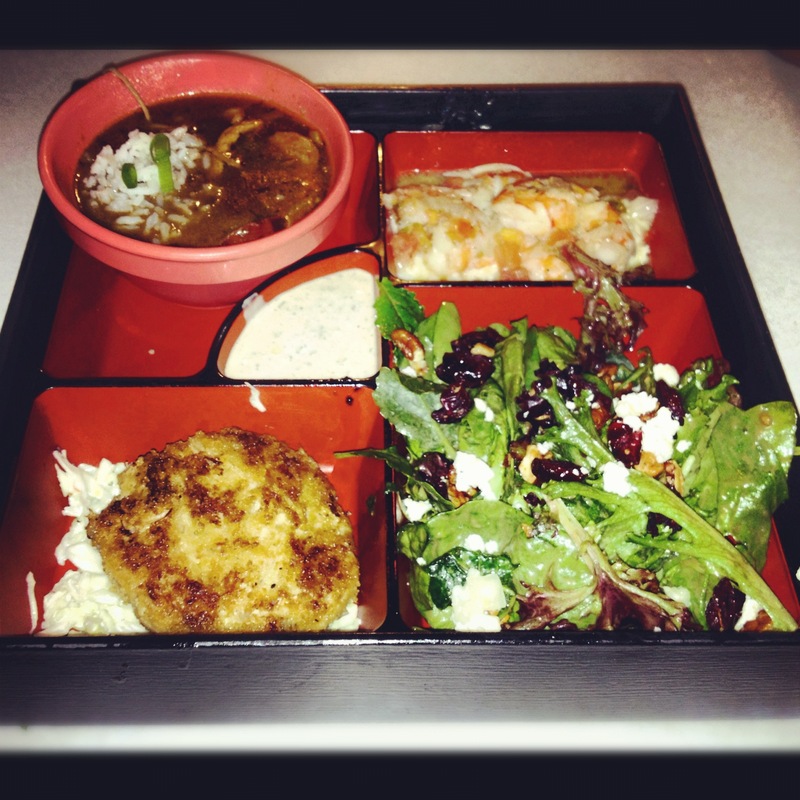 And for the main course I ordered the “TV Dinner” which is a bento box filled with chicken and sausage gumbo, crab cake with slaw, shrimp and grits, and a GoGo! Salad. 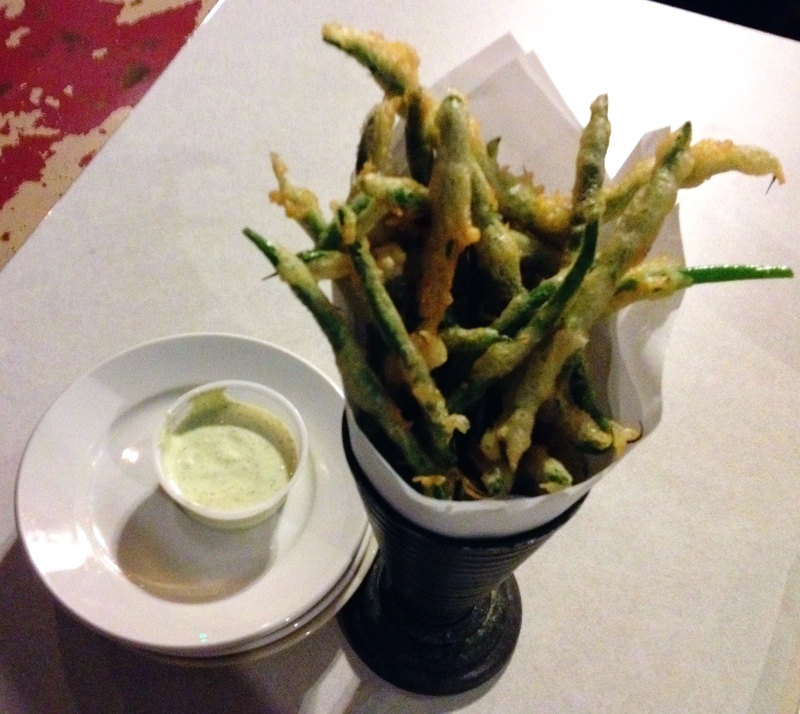 The tempura green beans arrived in a unique presentation, lightly battered, but still crispy and the dipping sauce had a punch of flavor and complemented the beans perfectly. What a great appetizer. And since it was a “veggie”, I didn’t feel guilty about eating more than anyone else at the table. 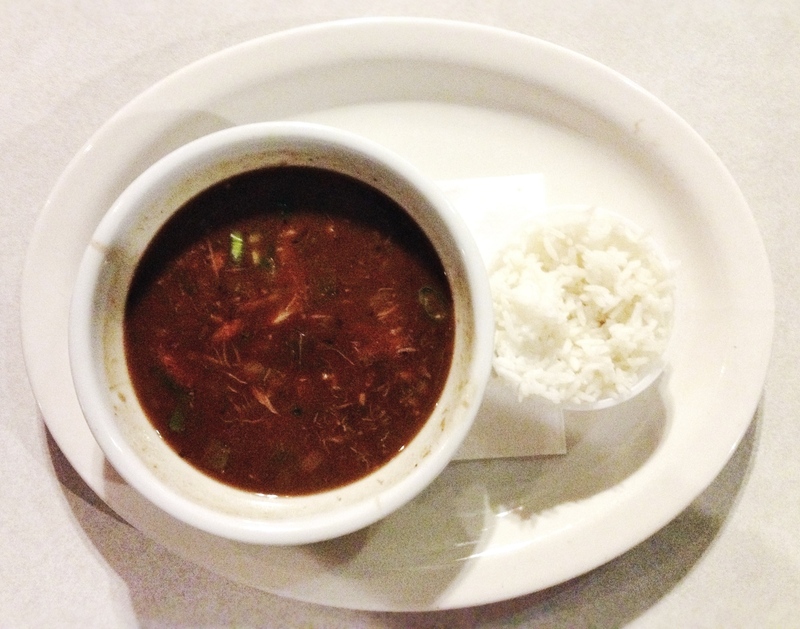 A simple white plate, white bowl with a small plastic cup filled with white rice and a bowl of dark gumbo. The presentation is irrelevant because Go Go Gumbo! 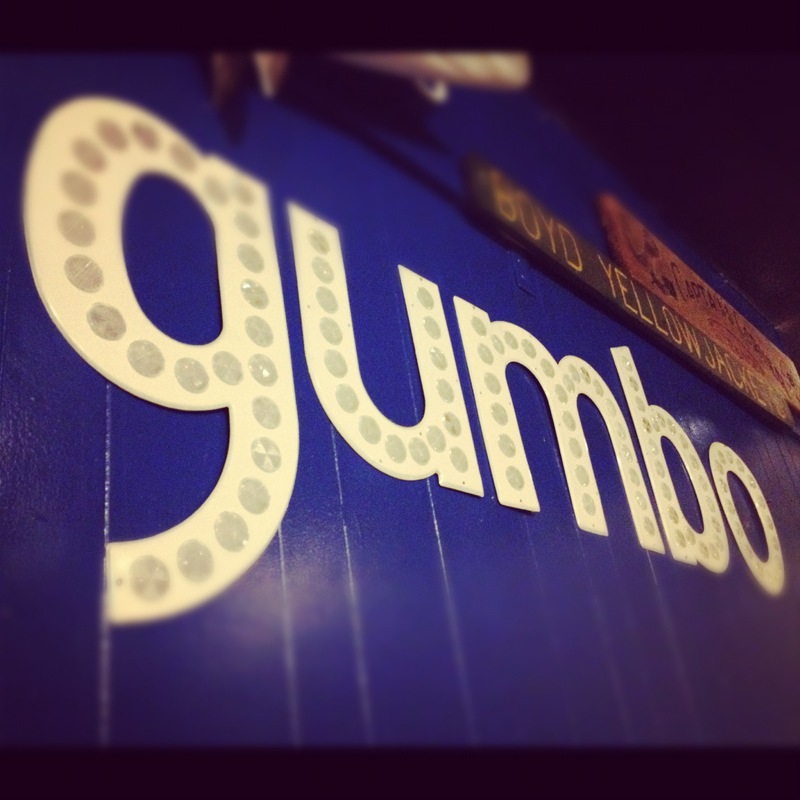 lets the gumbo speak for itself and it doesn’t just speak, it screams flavor. 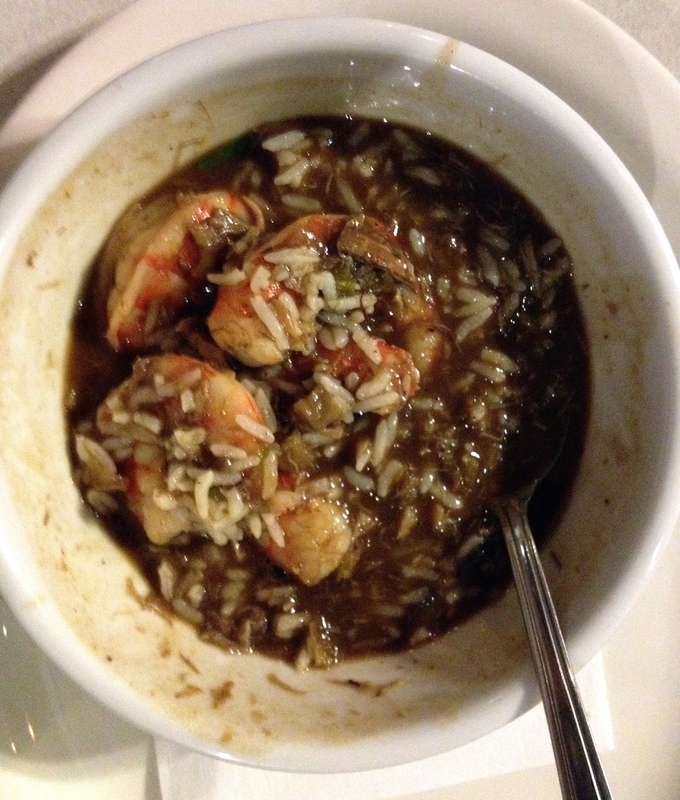 It has a deep, dark, thick, rich roux and it tasted exactly like my all-time favorite seafood gumbo that I used to get from Don’s Seafood on Airline Highway in Baton Rouge, LA. But I wasn’t in Louisiana, I was in the middle of nowhere Boyd, TX, and loving it. Like the true gumbo freak that I am, I immediately attacked the chicken and sausage gumbo. The roux was perfect, there were big chunks of chicken and lots of andouille sausage. It was loaded with spices and great flavors. The chicken and sausage was another great gumbo! My mission was basically complete. I came to Boyd looking for gumbo and they delivered big time. Everything else in the TV Dinner was just a bonus, and because I care, I made the sacrifice of eating the rest of it (oh and part of my wife’s TV Dinner too). The crab cake was served on a bed of cole slaw along with a dipping sauce. It was cooked to golden brown perfection and had great crab meat flavor with herbs and spices. The cole slaw was creamy, sweet and complimented the crab cake perfectly. Next, I devoured the shrimp and grits. This dish had big shrimp and big flavor. Grits were creamy, shrimp were plump, and the sauce was soo good I made a few sounds that probably worried my wife. Very satisfying. But wait, there’s more…The GoGo! Salad. It was all I had left in my TV Dinner. And just like everything else Chef Thome prepared, this blew me away. The salad was awesome: baby mixed greens, baby spinach, spiced pecans, feta cheese and dried cranberries with a perfect sweet balsamic dressing that blended all of the flavors together. I like eating salad, but I loved eating this salad. 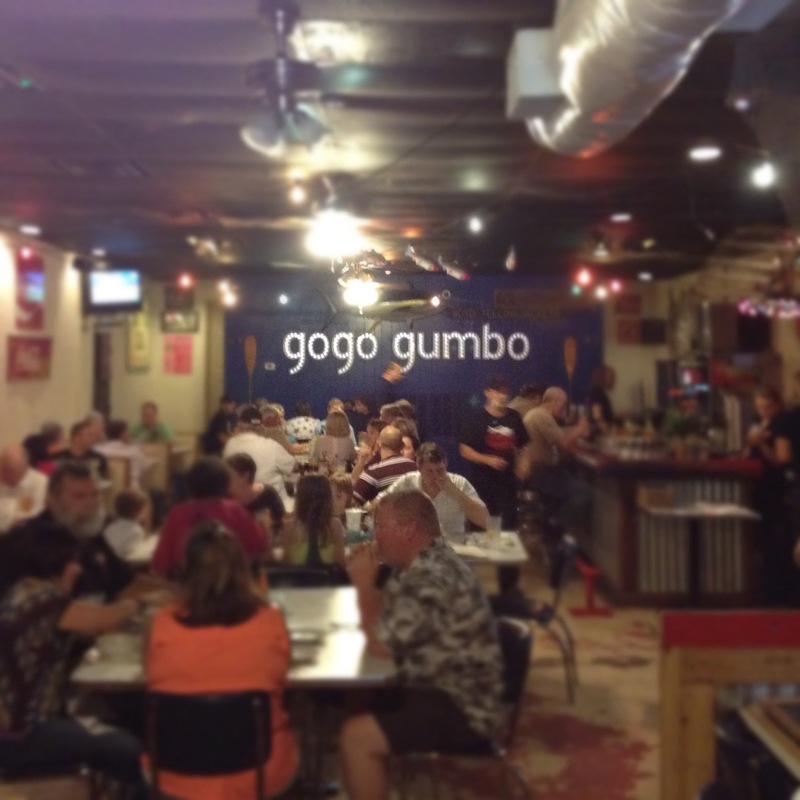 The Verdict: Well played GoGo Gumbo! You made this gumbo obsessed Louisiana native a huge fan. Great story, great atmosphere, great service, and most importantly, incredible, fresh, tasty, delicious food. GoGo Gumbo! All I can do is warn you: I WILL BE BACK! Online: Visit GoGo Gumbo’s website here or follow them on facebook here.